After years of hiding from western eyes, China has transformed itself into a true heavyweight on the global tourism scales. Welcoming more than 55 million foreign visitors each year, China is by far the most-visited country in Asia and one of the top travel destinations in the world. According to statisticians, it might well eclipse France as the world's most popular tourist destination by the year 2020. One of the most ancient civilisations on earth, China's heritage spans the ages and is home to Neolithic structures, the Silk Road, and more than 2,000 years of Dynastic reign. The country's long and proud cultural heritage is reflected by the fact that it is home to no fewer than 50 UNESCO World Heritage Sites. There are more 'must-see' cultural attractions in China than travellers could ever hope to experience in a single visit, including fascinating sights like the Summer Palace, the Stone Forest, and the Beijing National Stadium. Tourists to China looking to explore its incredible natural bounty will be particularly blown away by the Five Sacred Mountains, as well as the Jiuzhaigou Valley, a natural wonderland filled with snow-capped mountain peaks, crystal-blue lakes, cascading waterfalls, and lush vegetation; a prime example of the astonishing variety of China's natural landscape. China is an enigmatic and mysterious country, where modernity and tradition, as well as progress and conservatism, all coexist in a tumultuous morass. It is one of those countries that has tourists returning home filled with a far greater sense of wonder at the world than when they left. Due to its enormous size, deciding on the best time of year to visit China will depend largely on which areas travellers wish to explore. In general, however, spring (April and May) and autumn (September and October) are probably the best months to visit China, as temperatures are mild, there is not too much rain, and peak tourist season (which is in summer, from June to August) can be avoided. More about China's Climate and Weather. -The Imperial Palace (or Forbidden City) is the best-preserved ancient structure in the whole of China. -Every visitor to China should see the famous Terra Cotta Warriors of Xi'an. -The Potala Palace, once the residence of the Dalai Lama, is a wonderful window into the richness of Tibetan culture. -Exploring The Underground City is a surreal and intriguing experience. Read more about China Attractions. -Join the thousands of annual cultural pilgrims for a walk along a section of the Great Wall of China. -Visit China's most famous animal at the Chengdu Panda Center. -Experience the juxtaposition of old and new Shanghai by walking along The Bund. 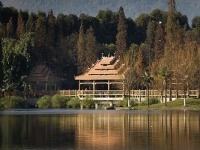 -Take a trip to the Huaqing Hot Springs to bathe like an emperor. There are cheap direct and indirect flights to China available from the United Kingdom and the United States. The most popular entry-points into China are Beijing (Beijing International Airport) and Shanghai (Pudong International Airport). Get more information on China Airports. Rice: A Novel by Tong Su, Empress Orchid by Anchee Min, Iron and Silk by Mark Saltzman, and The Joy Luck Club by Amy Tan. Cui Jian, Rynn Lim, Andy Lau, and Wang Lee Hom. The Painted Veil (2006), Crouching Tiger, Hidden Dragon (2000), Hero (2002), and The Inn of the 6th Happiness (1958). Sample as many tea (cha) variations as possible. If you're looking for something a bit stronger, rice wine (mijiu) is worth a try. Duck (kaoya) is generally a favourite among westerners, as are chive dumplings (jiucai jiaozi). Porcelain products and jade jewellery make very popular gifts. If travelling in spring or summer, be sure to take a lightweight rain slicker along; if travelling in autumn or winter, travellers should make sure to pack a good coat or jacket. Anti-bacterial hand soap is a great idea, helping to stave off diseases which can spread from using public toilets or eating in local restaurants. The Longqing Gorge Ice and Snow Festival is a spectacular winter celebration, featuring fun activities, ice sculptures, ice lanterns and a dazzling fireworks display. Chinese New Year is a raucous affair, with fireworks and loud music going on late into the night, especially in Beijing. The Great Wall Marathon is worth taking part in for its beautiful setting, even for the tragically unfit. More information on Events in China. -About one in five people in the world is Chinese. -Ice cream, gunpowder, cross bows, paper, kites, and the compass are all Chinese inventions. -Toilet paper was also invented by the Chinese, in the late 1300s, but it was only used by emperors. -In the 1930s and 1940s, Shanghai was the only port in the world to accept Jews fleeing the Holocaust without entry permits. A mysterious and wonderful land where ancient history and hyper-modernity exist side-by-side, China is a challenging and deeply rewarding place to visit.